1 Place chickpeas, scallions, egg, flour, oregano, cumin and salt in a food processor. Pulse, stopping once or twice to scrape down the sides, until a coarse mixture forms that holds together when pressed. (The mixture will be moist.) Form into 4 patties. 2 Heat oil in a large nonstick skillet over medium-high heat. Add patties and cook until golden and beginning to crisp, 4 to 5 minutes. Carefully flip and cook until golden brown, 2 to 4 minutes more. 3 To prepare sauce & serve: Meanwhile, combine yogurt, tahini, lemon juice, parsley and salt in a medium bowl. Warm pitas, if desired. 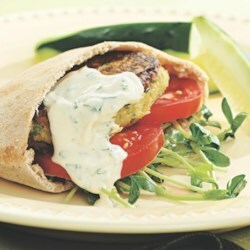 Divide the patties among the pita halves and serve with the sauce. Make Ahead Tip: Cover and refrigerate the uncooked burger mixture and tahini sauce for up to 2 days. Ingredient Note: Tahini is a thick paste made from ground sesame seeds. Look for it in the Middle Eastern section or near other nut butters in large supermarkets.